sarah-jane down the lane: The big reveal! Ramblings of a country girl and tales from the Garden of England! Awake! and feeling very Skippy indeed! Bounced up out of here! and them quick sticks back upsatirs to squeeze this lot into a battered old suitcase and then off at last! fait-acomplis! I am writing this on Tuesday evening and I leave first thing in the morning Wednesday. I am attempting to post this automatically, hope it works! I can't begin to tell you how much this means to me, you may remember a wistful post back in July (Mornington Memories) about my "faraways" well that was the start of all this as the best hubby in all the world knew how sad I was not to be seeing them all and has made all this possible. So Mr.Lane, I know you occaisionally meander onto my blog, and I hope you do because I want to thank you with all my heart, you are the BEST! Little brother also sometimes reads too hence my secrecy! but to all my brilliant friends au revoir for now, I hope to manage a post whilst I am out there! I will definately have lots to tell you about when I get back, Melbourne is so great for amazing Crafts People so watch out! Well exciting isn't the word! Hope you had a safe journey and that you and your family have the most fabulous time together. What a wonderful husband you have. 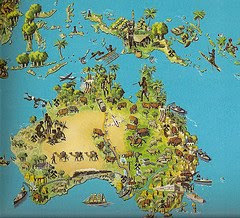 Welcome to Australia. I hope you enjoy it. Hi Sarah! Have a great time! Hi Sarah You have got me all excited now…have a fab time and I will look forward to your return. I’m off too catch up on your other posts now! 'Yay' you did it!! Well done for keeping it stum!! G'day to you to or is it G'night at the 'mo?? I am so happy for you and I know your brother will be blown away. This Missouri Ozarks farm chick just celebrated her #57. Oops, did I say that out loud? You have a great trip and enjoy your brother. I'm so glad I popped in, I enjoyed my visit. As we say here down on the Ponderosa, "ya'll have a wonderfully blessed day!!!" Yay! What fun. Hope it all went well. Enjoy your time and I look forward to hearing and seeing about your visit when you return. Ahhh...wishing you bushels of fun! 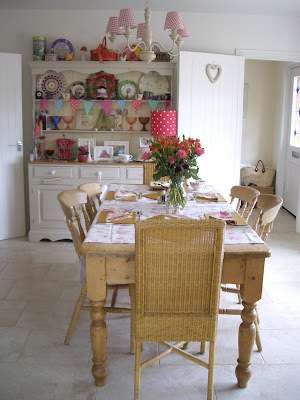 I adore your lovely sitting area...your cabinet looks full of yummy eye candy dishes! Can't wait to hear about your surprise trip on your return....thanks so so so much for all your lovely comments you leave on my blog! You lucky thing! I hope you have a fantastic time. Happy 40th to your brother. I so love your blog! I just found it and love every bit of it! I have been blogging since last Christmas and love it so much. Wow - you lucky thing! Have a very good time and take lots of nice photos! What a lovelt home you have! And such a lovely surprise for your brother, hope everthing goes well and you have a great time! Look forward to reading all about it! Lucky girl! Have a fantastic time. What a lovely surprise for your Brother. Not wonder you were all exited about it. Look forward to reading all about it. As I am writing this, you are probably fast asleep. Oh good, you found me! It is such a little Lane and hard to find! This is where I carve my name in the bark. Stepping down the Lane you will find tales from the Sussex High Weald and other everyday ramblings! I simply like to notice things, you know just to be curious that's what I do! I worked in retail for longer than I dare to remember, visual merchandising was my thing. These days I turn my hand to styling and creative consultancy. I just love to visit!